From:   Brian Mellors, London. England. second 497 AutoStar, but both work about the same. SUGGESTION:  On how to sort out the ETX / AutoStar. 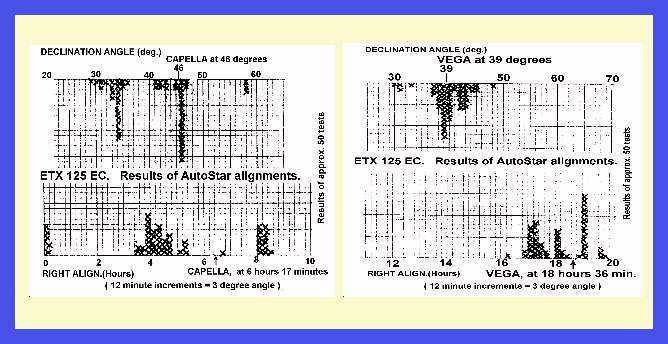 AutoStar alignment stars 1 and 2. 2. Find out how good your ETX AutoStar is at star pointing. ie,   one small division on scope scales. times  - it will take about an hour. degrees at top of sheet,  RA in Hours and Minutes at bottom of sheet. fun,  BECAUSE YOU KNOW IT WORKS OK.
"Vega", each of 50 tests. Brian Mellors. London. March, 2002. "On Starting with my Meade Scope",   - next Thursday 28th March. them straightaway. Regards. His pal,  Tony.